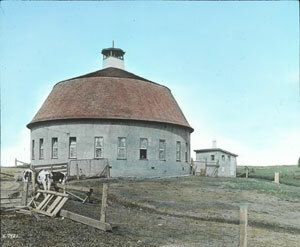 Hand-colored lantern slide titled "A modern dairy farm," ca. 1925. The Special Collections & Archives Research Center (SCARC) accepts additions to its collections and holdings, especially unpublished personal papers and organizational records such as correspondence, diaries, photographs, scrapbooks, and research files that complement records created by Oregon State University. When materials are transferred, donors and SCARC staff both complete an "Instrument of Donation" form, which transfers legal custody of the materials to SCARC and also prescribes donation conditions and (if any) restrictions. General information on donating materials is available online in the form of two brochures published by the Society of American Archivists, "Donating Your Personal or Family Papers to a Repository" and "Donating Your Organizational Records to a Repository". Oregon Administrative Rules, Chapter 166, stipulates that archives of the institutions of the Oregon State System of Higher Education may "add records of private origin which relate to the history of the institution, its faculty and students, or to academic or research interests of their communities." Collections and manuscripts are selected for preservation in the Special Collections & Archives Research Center primarily because of their historical research value. Materials accessioned will generally document the history of Oregon State University, its community, and activities, or will fit within SCARC's broader collection development guidelines. Historical collections and manuscripts accessioned by SCARC may include memorabilia, records, printed documents, photographic images, maps, graphic materials, books and other historically significant materials in other physical forms. The historical resources of the Special Collections & Archives Research Center are available for public use on the premises during regular business hours, unless otherwise specified in the donor agreement. Unless otherwise restricted by copyright or by the donor and agreed to by SCARC at the time of acquisition, all literary rights are conveyed to the Special Collections & Archives Research Center. All donor access and use restrictions and conditions will be specified in the donation agreement. SCARC can assume no responsibility for abuse of literary or copyright restrictions by users of research materials. Gifts to the Special Collections & Archives Research Center are considered outright donations to be used in the best interest of SCARC. Donations become the sole and irrevocable property of the Special Collections & Archives Research Center. Usually, accepted gifts are considered extremely important or the best historical resources available at the time acquired. However, no individual or institution can predict or govern the changing attitudes of future generations, nor guarantee permanency beyond the best available preservation procedures. SCARC reserves the right to reevaluate and reappraise historical material in its holdings and to deaccesion them when appropriate. Deaccessioned collections and items weeded from collections during processing, due to duplication, irrelevance, limited use, or deterioration, will be offered to the original donor or their agent if so requested at the time of donation. If the donor wishes not to reclaim the material or can not be located, SCARC reserves the right to offer the material to other depositories or discard the items. Any material declared expendable must be approved by the Director of SCARC. Donations of historical material to a public research facility may be tax deductible. However, the Special Collections & Archives Research Center can not appraise donations for tax purposes. For the protection of the donor, it is recommended that such appraisals be done by a disinterested third party and before title to the material is conveyed to the Special Collections & Archives Research Center.